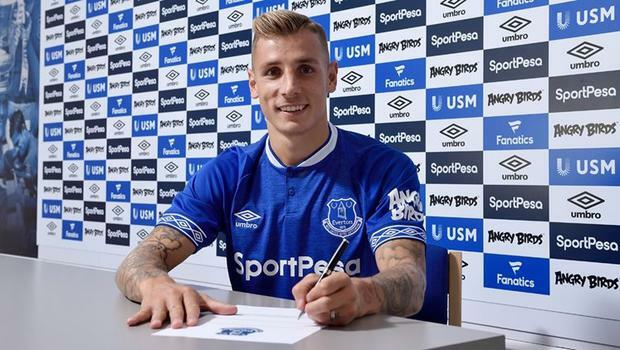 Marco Silva has made his second Everton signing with the capture of left-back Lucas Digne from Barcelona. The 25-year-old has committed to a five-year deal at Goodison Park and follows Richarlison, who made the move from Silva's former club Watford last month. Digne has an impressive CV having begun his career at Lille before moving on to Paris St Germain, Roma and then Barcelona, for whom he made 46 appearances in two seasons. The Frenchman said on evertontv: "Everton is a big club with a great history. I want to play games, win games and excite the fans with the quality of our football. "I played good football in Rome and I played well, too, in Barcelona. I progressed a lot as a player and as a person by playing with the best players in the world. "I want to show my best football here and discover the best league in the world. Everybody loves the Premier League. I am loving the fact I am coming here. "The club has brought in a lot of players and we are building to bring some success in the Premier League. We will work together as a team to try to make this happen. That is what is important and I could not be more excited about this challenge." Left-back was a problem position for Everton last season, with stalwart Leighton Baines missing a big chunk of the campaign through injury and Cuco Martina playing out of position as cover. Digne is known as a player who loves to get forward and he has been capped 21 times by France, although he missed out on their World Cup-winning squad. Silva said: "It is important to say that he is a player who, from the first moment he was contacted, showed enormous desire to play at Everton. "He is a high-quality player, aggressive, with good technical ability and in the past five seasons he has played two years at Paris St Germain, one in Roma and for the past two seasons he has demonstrated his clear quality in Barcelona. "Lucas is a player who will add competitiveness in a position where we only had Leighton Baines last season and he is accustomed to winning. This is his mentality having captured titles in his career and having these on his resume."